A TV, feature film, comic book writer, and novelist, Madeleine is the winner of the Sloan Fellowship for screenwriting, and the Gold Aurora and Bronze Telly for a PSA produced by Women In Film. She also won numerous awards while completing the UCLA MFA Program in Screenwriting. Having run five successful Kickstarter campaigns, Madeleine also teaches a seminar on crowdfunding at Pulp Fiction Books in Culver City as well as guest lectured at Scriptwriters Network and Dreamworks Animation. Her debut novel, Boston Metaphysical Society: A Storm of Secrets not only received a Silver Medal in the Science Fiction/Fantasy category of the Feathered Quill Book Awards, but also received The Write Companion Award for Best Overall TOP PICK in the Adult, C A TV, feature film, comic book writer, and novelist, Madeleine is the winner of the Sloan Fellowship for screenwriting, and the Gold Aurora and Bronze Telly for a PSA produced by Women In Film. She also won numerous awards while completing the UCLA MFA Program in Screenwriting. Having run five successful Kickstarter campaigns, Madeleine also teaches a seminar on crowdfunding at Pulp Fiction Books in Culver City as well as guest lectured at Scriptwriters Network and Dreamworks Animation. Her debut novel, Boston Metaphysical Society: A Storm of Secrets not only received a Silver Medal in the Science Fiction/Fantasy category of the Feathered Quill Book Awards, but also received The Write Companion Award for Best Overall TOP PICK in the Adult, Children’s and Young Adult categories. Nominated for a 2012 Airship Award (SteamCon) and a 2013, 2014 and 2015 Steampunk Chronicles Reader's Choice Award, the webcomic received an Honorable Mention at the 2013 GEEKIE AWARDS and was nominated in the Best Comic/Graphic Novel category in 2014. 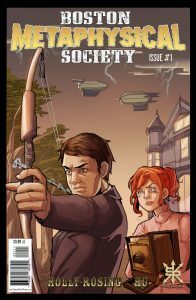 Other comic projects include the short story, The Scout which is part of The 4th Monkey anthology, The Sanctuary (The Edgar Allan Poe Chronicles anthology), The Marriage Counselor ( The Cthulhu is Hard to Spell anthology) and the upcoming The Airship Pirate which will be part of The Rum Row anthology. The Boston Metaphysical Society short story, Here Abide Monsters, is part of the Some Time Later anthology from Thinking Ink publishers. The first Boston Metaphysical Society novel, A Storm of Secrets, was released in 2018. 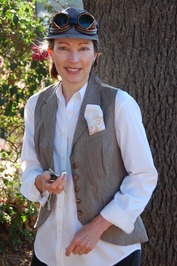 Formerly a nationally ranked epee fencer, she has competed nationally and internationally and an is an avid reader of science fiction, steampunk, fantasy and historical military fiction. Madeleine lives with her rocket scientist husband. To ask Madeleine Holly-Rosing questions, please sign up. Sidney is a nineteen year old woman who outwardly appears to be living the dream you only see in the movies. Her rock star boyfriend has gotten a big recording contract and wants her to live with him in the record company's posh digs in Los Angeles. Sidney is a nineteen year old woman who outwardly appears to be living the dream you only see in the movies. Her rock star boyfriend has gotten a big recording contract and wants her to live with him in the record company's posh digs in Los Angeles. Young and in love, she throws away her own dreams to follow him, but when her grandmother has a stroke she returns home to take care of her. The only parent she has ever known, Sidney loves her dearly, but when Sidney finds a necklace once owned by her mother, strange things begin to happen. This was a fast-paced and easy to read fun book. The descriptions were vivid and I felt the author did a good job of setting a sense of place. As a character, Sidney was frustrating as she and her best friend, Chrissy, bought into the female stereotype of letting a man convince her that his hopes and dreams were far more important than her own. Since this is a series, I'm hoping this is part of her character arc as there were moments where she finally asserted herself, but then fell back into the trap when her boyfriend started paying attention to her again. Also, the supernatural elements came in a bit late and weren't set up well, and I felt the biblical references came out of left field. We’d love your help. Let us know what’s wrong with this preview of Between Dreams by Cynthia Austin. We’d love your help. 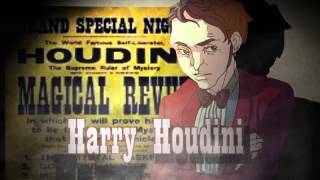 Let us know what’s wrong with this preview of Boston Metaphysical Society by Madeleine Holly-Rosing. In the harsh Cornwall countryside of the mid-1700s, Scarlett lives with her brother and his wife as they struggle against poverty and living under the boot of a smuggler. Their story intertwines with Flora, a would-be inn keeper and healer, whose hus In the harsh Cornwall countryside of the mid-1700s, Scarlett lives with her brother and his wife as they struggle against poverty and living under the boot of a smuggler. Their story intertwines with Flora, a would-be inn keeper and healer, whose husband died in a cave-in several years earlier. When Scarlett rescues the sole survivor of a doomed ship, all the secrets, lies, and betrayals come to a head in this small English village. I enjoyed this story. The characters were well-developed and I felt like I knew who they were and the conflict was organic. I felt like I was transported back to Cornwall and into the bitter lives of the characters. It often reminded me of the TV show Poldark, but from the point-of-view of the the downtrodden. We think our lives our bleak now, but these people got hammered on a daily basis. The ending felt like it kind of dropped off, but that was probably because the author was setting things up for the next book. We’d love your help. Let us know what’s wrong with this preview of Bridles Lane by Johanna Craven. (For tech nerds only.) In the near future, a group of intrepid engineers build the first ever "Launch Loop." An environmentally sound way to launch into space, its purpose is to slingshot capsules from zero to launch earth escape velocity. This story (For tech nerds only.) In the near future, a group of intrepid engineers build the first ever "Launch Loop." An environmentally sound way to launch into space, its purpose is to slingshot capsules from zero to launch earth escape velocity. This story focuses on the trials, tribulations, and sabotage the team building it faces. We’d love your help. Let us know what’s wrong with this preview of Steeplejack by A.J. Hartley. A team of a psychologist, a bio-engineer, and a social psychologist are tasked by the VA to ascertain whether a new technology called the "Blocker" could help deal with phantom limb pain and possibly PTSD. (The "Blocker" can redirect brain linkages.) A team of a psychologist, a bio-engineer, and a social psychologist are tasked by the VA to ascertain whether a new technology called the "Blocker" could help deal with phantom limb pain and possibly PTSD. (The "Blocker" can redirect brain linkages.) If it does, then the creator, Dr. Ned Worthington and his company, would receive additional funding into further research. But oddly enough, Dr. Worthington is resistant to the inquiries. All is not what is seems in this intelligent techno-thriller. A well-written book, the first half is a bit slow and you really have to pay attention to the intricacies of the technology and it's larger implications, but the second half takes off. The characters are well-developed and it is obvious the author knows what he is talking about. This is not your traditional thriller due to the pacing and the large amount of time spent explaining the tech. I also wondered how one character was able to get a gun past airport security so easily. Though the ending was emotionally satisfying it seemed too easy. But that could just be me. We’d love your help. Let us know what’s wrong with this preview of Of Half a Mind by Bruce M. Perrin. This book follows the fictional story of three young baseball players in the minor leagues in the 1970s. Jimmy, Bud, and Bobby are three pitchers who hope to be called up to the majors. It follows their personal and professional trials in what can be This book follows the fictional story of three young baseball players in the minor leagues in the 1970s. Jimmy, Bud, and Bobby are three pitchers who hope to be called up to the majors. It follows their personal and professional trials in what can be a brutal profession. I would have loved to have given this 4 stars because the author clearly knows and loves the game from the bottom of her heart and that affection shines through in every detail. The first quarter of the book is tremendously engaging and you don't have to be a baseball fan to enjoy it. However, after that the POVs often switch multiple times in numerous chapters from third person to first person then back again. It was often unclear whether we were going back to Jimmy's POV (the main character) and then when I reread it, it was actually the internal voice of the character that had previously been in third person. It got to be confusing. There were also several short chapters where nothing much happened and when Bobby suddenly talked to an old woman when previously he never talked to anyone seemed very much out of character. We’d love your help. Let us know what’s wrong with this preview of Empty seats by Wanda Adams Fischer.